Best pocket bikes for kids: We checked a variety of brands and models, including electric and gas-powered. We’ve used several criteria to choose our top picks. The main criteria are price, durability, and customer satisfaction. And of course how cool it is! Read on to see our top 3 choices for: Best pocket bikes for kids 2017. A very affordable electric pocket bike perfect for kids. This pocket bike is a “sport bike” style. The design is really cool and looks just like a larger motorcycle. While not the fastest one on our list, it is one of the lowest priced. The fact that it is electric powered is a plus for some people that don’t want the complications of dealing with a gas-powered engine. The bike will run for about 45 minutes on a charge, then takes roughly 4 hours the charge again. You can buy a 2-pack of batteries here for around $30, so you can keep the kids riding non-stop. The top speed is about 15 miles per hour, which is actually pretty fast when you see a kid cruising around on one of these. The reviews are good, and it has a 4 star rating on Amazon at the moment. Por the price and the features this one made it to the top of our list: Best pocket bikes for kids. Buy one here. This is our choice for a gas-powered pocket bike for kids. First off, let’s just start out by saying we have found mixed reviews on this pocket bike. We still like it, but there are some compalints about the bike needing adjustments. We expect this from any gas powered motorcycle, but if you aren’t somewhat interested in making minor adjustments this may not be the bike you want to buy for your kids. Of course there are also good reviews! Including ours. We like the price of this bike. It’s under $400 with all the features you could want. It will top out somewhere around 20 MPH. It has real tires, front and rear disc brakes, and a 33CC pull start engine. The styling is cool and looks very much like a real sport bike. 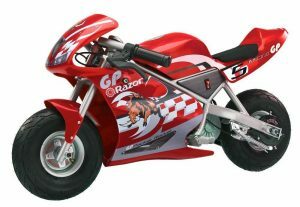 Your kids will have a lot of fun riding this pocket bike around. This is a very affordable gas-powered pocket bike. And it’s a lot of fun. It is 2nd on our list: Best pocket bikes for kids 2017. You can buy one here. Here’s another electric-powered pocket bike with aggressive styling. This is a 36V electric powered pocket bike. It weighs in a little heavier than the others at 86 pounds and can hold a rider up to 150 pounds. It tops out at around 15 MPH, which is definitely average for an electric pocket bike. You can find it for sale in the $350 price range. Our third choice for the best pocket bike for kids in 2017. You can buy one here.